We spent last weekend in the countryside for my Grandad's 90th (more photos to come from the weekend!) on Sunday we all went for a long walk on the South Downs in the bright sunshine. In my family, a "quick walk before lunch" often means a 2 hour long hike including some pretty steep hills.. which I've learned to love over the years. We get to catch up, everyone has long meaningful conversations with no distractions - it's the best! 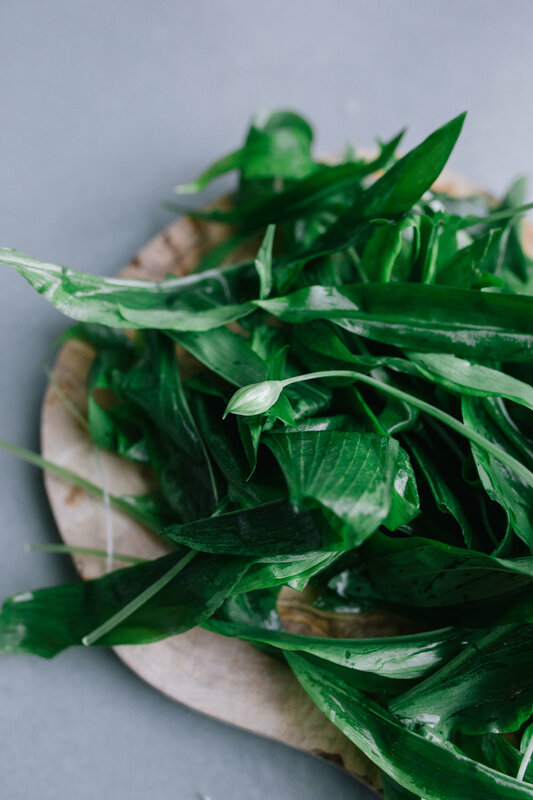 On the way down from the national park we found a spot in the forest with a lot of wild garlic, so we picked as much as we could, salivating at the idea of making a pesto later that night! I made ours with hazelnuts as I had some leftover from making my grandad's birthday cake plus some almonds I had in the cupboard, but you can use pretty much any nut : walnut, cashews, almonds, pine nuts... the choice is yours! 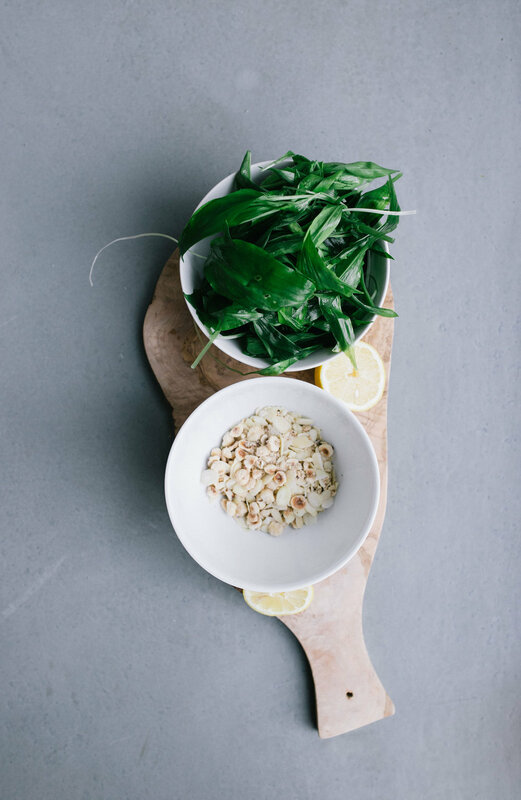 This pesto also happens to be an all rounder, if it's not wild garlic season, you can replace it with good old basil, or half basil half rocket! I've done half basil and half dark kale before and it works really well. 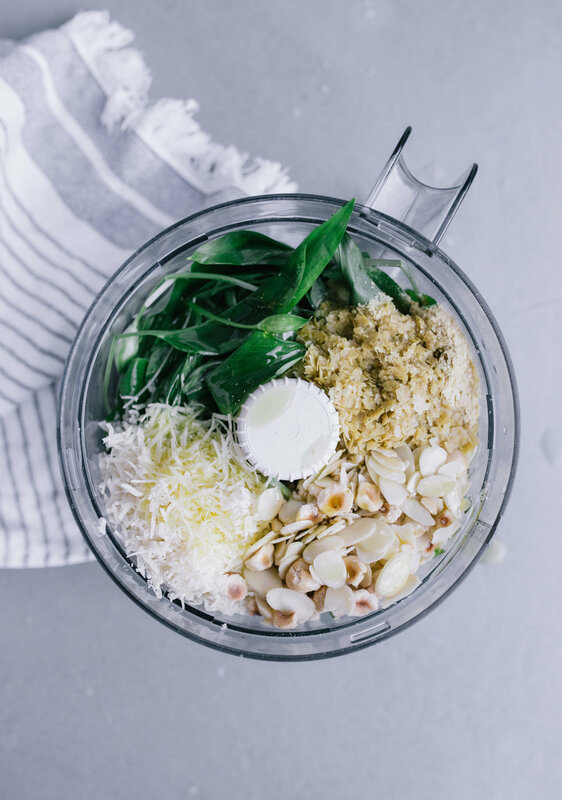 - Place the wild garlic, hazelnuts, vegan parmesan, garlic clove, "noosh" and lemon juice to your food processor or blender. - Do a taste test, season with salt and pepper, add more lemon if you like it more tangy, blend again until all combined. - Serve with pasta and extra vegan parmesan or keep in an air tight jar in the fridge, it should keep for up to a week. We had it last night on some gluten free fusilli and it was so good! I shot these just before the light went.. so as the evening went on the photos get a bit more of a purple haze ha, but what a dream to be able to make dinner while it's still light outside! Today I had a little bit of pesto leftover so I had it for lunch with some homemade chips and used it as a dip... SO GOOD! Homemade pesto is just the best. 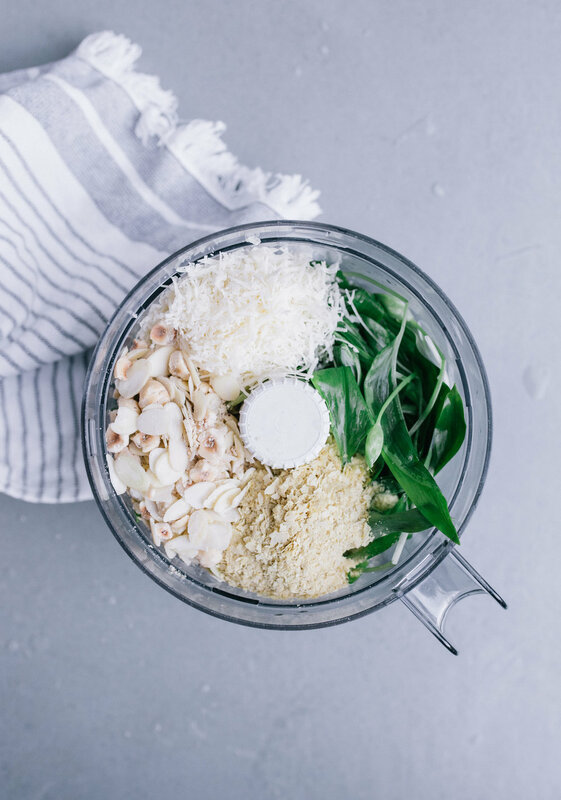 I am obsessed with that Violife parmesan, but I've made this recipe with no parmesan and it works as well. Just add a little more "noosh"! If you make this at home remember to tag me on Instagram, I love to see when you guys make my recipes!